Mr Phil is the alter ego of entertainer Phil Blackmore. 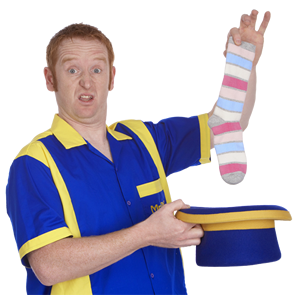 Phil has been a professional performer all his adult life and is one of the UK’s top jugglers and variety entertainers. He appeared on ‘Britain’s Got Talent’ in 2008, reaching the semi finals round and performing live on TV to 12 million people. Phil began performing shows at a very young age and while still at school he worked in Harrods department store and Hamleys toy shop in London demonstrating magic tricks. On leaving school he became a Butlins Redcoat, was a street performer at Chessington World of Adventures and joined the Magic Circle. Over the last 20 years he has performed his juggling show in theatres, hotels, holiday centres and onboard luxury cruise ships. He has also been highly in demand as a children’s entertainer for corporate events performing regularly at top UK venues like Wentworth Golf Club, Fontwell Park Racecourse, Bluewater, Mercedes-Benz World and Wembley Stadium, and all around the world in places such as Monte Carlo, Amsterdam, Bahrain, Singapore and America. Phil relocated from London to South Devon in 2009 and has quickly established himself as one of the area’s top children’s entertainers. As a full time professional performer he is a member of Equity and has full public liability insurance.